Designed specifically for the kick drum, the AE2500 dual-element instrument microphone features cardioid condenser (electret) and dynamic capsules combined in one housing. The dynamic element captures the attack of the beater; the condenser element captures the tonalities of the shell. According to A-T, the condenser diaphragm is tensioned and aged for long-term consistency and stability. The capsule diameter is approximately 16mm. The moving-coil dynamic capsule is larger, measuring approximately 28mm in diameter according to SoundOnSound. The two elements are positioned in a perfect phase relationship, which would be difficult or impossible with two separate microphones. 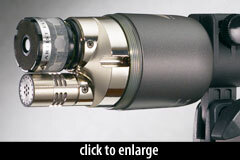 The condenser element features an integral 80 Hz HPF switch and 10 dB pad. Ships with an isolation clamp and a 16.5' (5m) breakout cable that allows users to route the condenser and dynamic elements separately. (Note that you’ll need two preamp channels.) The cable is a 5-pin XLRF to two standard 3-pin XLRM connectors) for separate control over each element. [T]he AE2500 provides the best of both worlds — an equalised dynamic mic character similar to the AKG, Sennheiser and Beyerdynamic offerings, combined with a flatter, more neutral output providing the natural tonality required in acoustic music. Best of all is the ability to mix and match these characters to obtain the perfect blend, without fear of phase problems. The AE2500 was a jaw dropper on the bass drum. Processing the two elements separately (EQ, gating and compression) yielded an awesome sound… The dynamic element sounded a lot like my AKG D112, big bottom with a hint of attack. The condenser had a nice crisp attack and some drum resonance too. Blending the two together created a wonderful kick drum sound. What are the differences between the AE2500 and the ATM250DE? Cost: The AE2500 is ~25% more expensive, in part because the AE2500 came first and required the design of two new capsules. The ATM250DE is a second-generation product in which existing parts from the ATM line could be repurposed. Frequency response: the AE2500 has a superior low-end response, reaching down to 20 Hz. The ATM250DE drops off below 40Hz. Directionality: the dynamic capsule in the ATM250DE is hypercardioid. In the AE2500, the dynamic capsule is cardioid. The condenser element of the mic offered good transient snap and a concentrated note around 350 Hz, but less sustain and overall tonal character than the dynamic. The off-axis bleed was less severe relative to the dynamic track. In the mix I found the ideal proportion of the two mic elements to be roughly 65 percent dynamic, 35 percent condenser. Using much more of the condenser track tipped the tonal balance too much in the midrange direction, with a prominent bump around 350 Hz. 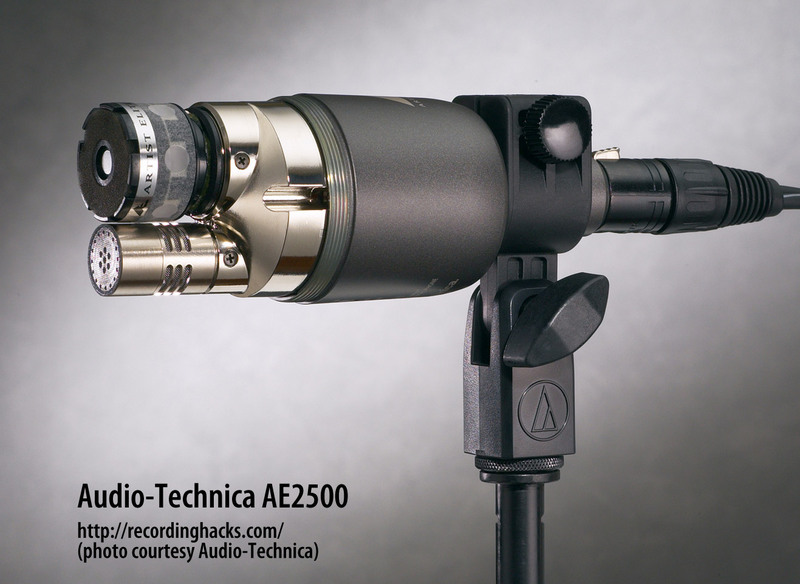 The Audio-Technica AE2500 is also known as: AE-2500. Frequency Response - Cardioid (Condenser element)Click Graph to Compare! Frequency Response - Cardioid (Dynamic element)Click Graph to Compare!